Skin cancer is a mutation that occurs in the DNA of skin cells. These mutations cause the cells to grow out of control and form a mass of cancer cells. Squamous cells lie just below the outer surface and function as the skin’s inner lining. Basal cells, which produce new skin cells, sit beneath the squamous cells. Melanocytes — which produce melanin, the pigment that gives skin its normal color — are located in the lower part of your epidermis. Melanocytes produce more melanin when you’re in the sun to help protect the deeper layers of your skin. Fair skin, especially blond or red hair and blue, green, or gray eyes. History of bad sunburns, especially blistering sunburns. Blood relative with a history of skin cancer. Use cover up with clothing, wide-brimmed hats and UV-blocking sunglasses. For extended outdoor activity, use a water-resistant, broad spectrum (UVA/UVB) sunscreen with an SPF of 30 or higher. Reapply every two hours or immediately after swimming or excessive sweating. Keep newborns out of the sun. Use sunscreens on babies over six months. See your dermatologist every year for a complete skin exam. Know your ABCDE’s and family melanoma history. “A” is for asymmetry; look for moles or spots where one half is unlike the other. “E” is for evolving; any changes, itching, stinging, bleeding, etc. If you have noticed any of these danger signs, contact your dermatologist. To diagnose skin cancer, a dermatologist looks at the skin and carefully examines growths, moles, and dry patches. 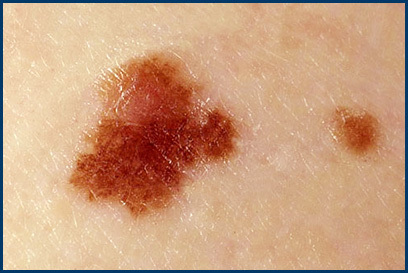 If the physician finds something that resembles skin cancer, then part or all of the suspicious area will be removed. The removed skin will be sent to a lab. Your dermatologist may call this a biopsy. Skin cancer cannot be diagnosed without a biopsy and a dermatopathology confirmation. Mohs surgery begins with the surgeon removing the visible part of the skin cancer. Because cancer cells are not visible to the naked eye, the surgeon also removes some skin that looks normal but may contain cancer cells. The goal is to save as much healthy skin as possible. This part of the surgery is performed one layer at a time. After removing a layer of skin, it is prepared so the surgeon can examine it under a microscope and look for cancer cells. This process continues until the layers are free from cancer cells. -9,000 OF THESE CASES WERE FATAL (ONE PERSON DIES PER HOUR). -PEOPLE UNDER 35 YEARS OLD THAT USE TANNING BEDS INCREASE THEIR RISK OF MELANOMA BY 75%. -From 1970 to 2009, the incidence of melanoma increased by 800% among young women and 400% among young men. Soderstrom Skin Institute is proud to be celebrating 40 years in Central Illinois! For additional information on sun safety and skin cancer, contact us toll free at 888.970.7546. To schedule an appointment with Board Certified Dermatologist Carl W. Soderstrom, MD at our Peoria office, please call 309.674.7546 For more information visit SoderstromSkinInstitute.com.